As on many past occasions (Hillsborough, Orgreave) police in South Yorkshire have once again worked against the human rights of UK citizens today (7th May). 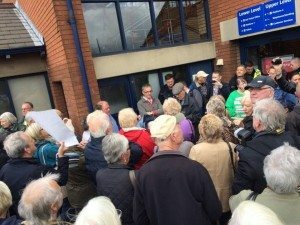 Over 100 people who were joining the 6th ‘The Freedom Ride’ (1) were prevented from entering Barnsley railway station and exercising their Article 11 human right to peaceful protest, instead being turned away from what is supposed to be a public facility by police and station staff. People from across South Yorkshire have been taking direct action to overturn the decision by South Yorkshire Passenger Transport Executive to remove the right to free travel for all concession holders on South Yorkshire trains(2); the legality of this decision is currently being challenged in the courts (3). Action takers from Sheffield and Doncaster later travelled by train, refusing to pay or show their passes in protest at the decision by councillors in South Yorkshire to axe their right to free train travel, and joined the peaceful action outside Barnsley train station.